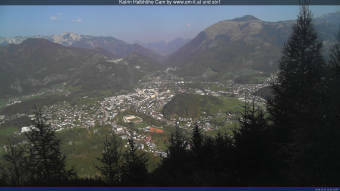 Webcam Bad Ischl: Bad Ischl Webcam - View from the Katrin Alm over Bad Ischl. Bad Ischl: Katrin, 0.8 mi. Bad Ischl: PANOMAX Katrin Seilbahn - Katrin Summit, 2.6 mi. Bad Goisern: Webcam RHV Hallstättersee, 5 mi. Bad Goisern: PANOMAX Bad Goisern am Hallstättersee, 5 mi. Altaussee: PANOMAX Loser Altaussee, Sandling, Ausseerland - Salzkammergut, 6.2 mi. Strobl: View onto the Wolfgangsee, 6.5 mi. Strobl: PANOMAX Strobl am Wolfgangsee, 6.6 mi. Altaussee: PANOMAX Loserfenster, Loser Altaussee, Ausseerland - Salzkammergut, 8 mi. This webcam Bad Ischl with the theme Mountains was added on January 26, 2006 and is operated by Tourismusverband Bad Ischl. It got 34413 visitors since then. Shouldn't this webcam work or should the link be wrong please report that here. You can add this webcam here to myCams.